Sponsor: FG Klöppeln des Eberswalder Kulturbundes e.V. There is an extensive list of exhibitions in lace and other needlework at http://tinyurl.com/zhvjqrp. These include exhibition on both historic and contemporary lace. A massive work has been making the rounds of various sites in Germany for the past few years – a now 76 square meter ‘quilt’ formed of lace squares. The Guiness book of World Records has been contacted about this. 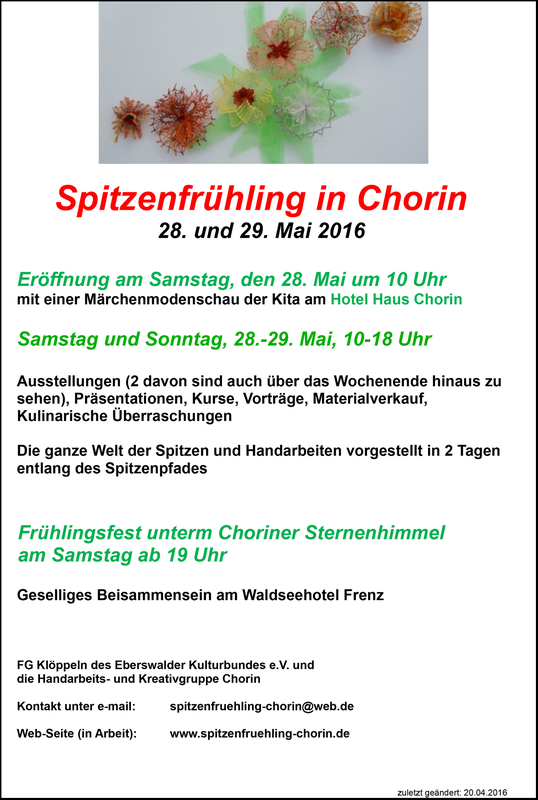 It will be on disply in the Hotel Haus Chorin from May 21 to June 5, 2016.